Mine is my avatar. Still doing some minor tweeks but for the most part this is what I run with. Last edited by DaltonSkyGazer; 11-27-2010 at 10:14 PM. I already posted the photos in another thread, but I'll put them in this one as well. The telescope is a Celestron SP-C6 on a Vixen Super polaris mount. MLaferriere, slalles and rohitud like this. wbean, satcomsta, Flexie and 2 others like this. And yet another posting saying and here are my two setups. Both are basic but work and are very portable. Beautiful view and nice setup Gus! If that's the view from your residence (and I'm assuming it is), then I'm jealous! I'll have to post a pic of my actual telescope assisted AP setup later, but here is one I took last November while doing some camera only piggy back work, trying to image Orion. Many other enviable rigs shown in this thread too! Had to LMAO at Jennifer's hi-tech AP rig. Too funny. 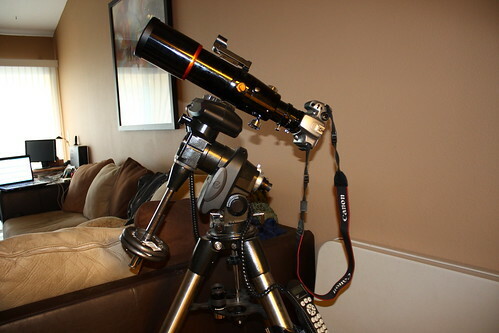 Being a refractor guy, Doug's setup has me salivating. Yoddha's JMI triplet is pretty too and Joe's Schmidt stack is damned impressive! Nice rigs to everyone I didn't mention too! Last edited by Ghostryderflyby; 03-09-2011 at 01:26 PM. Great looking rigs there folk. I had forgotten about this thread , will need to ( still ) retake my set ups. Windy and raining atm unfortunately. Cloud Dependant Astro Gear !!! C80ED, C130 Reflector/EQ3 , Ep's 8mm - 24mm Hyperion Zoom, 40mm SP, 20mm Meade Pl, 10mm Pl , 9mm Meade Pl, Celestron 2x Ultima Barlows. SW Star Adventurer.